Jeff Cable's Blog: Yeehaw - This was my first Rodeo!!! This was a family outing, and I didn't want the emphasis to be on the photography, so I decided to bring only one camera and one lens. I decided that, since I did not know how close we would be to the action and what we would see, I would bring the Canon 28-300mm lens since it gave me a wide range to shoot with. And knowing that there was going to be a lot of fast action, I did splurge and bring the Canon 1DX. We got to the rodeo around 2pm and found our seats, which were located about 40 rows up and pretty close to the center of the ring. At this point, I was wishing that I had brought the Canon 100-400 lens to let me zoom in a little closer to the action. I zoomed the lens all the way to 300mm and started shooting some of the bucking broncos. And with a little bit of cropping, everything worked out pretty well. I made sure to keep my shutter speed high to freeze the action. The fast shutter speed did freeze the action. When I saw this image and some of the others, I was wondering how these guys take this kind of abuse. I'll bet this guys back hurt more than mine after a full day of shooting! Having never been to a rodeo before, I was surprised when they announced some stunt motorcyclists. But, since I have always wanted to shoot photos of these guys, I was happy to see them there. I started taking photos of these guys from our seats, but as you can tell, the background was pretty distracting. I was trying my best to make this a family day, but I just couldn't help myself and quickly excused myself and ran down to the lowest seating to get a better angle. Getting down low, and having some nice clouds in the background, made the shot so much better! I could have cropped out the lights and tree tops from the bottom of this photo, but I like the way that it shows the height of the jump. I grabbed this wide shot, during the finale, when they were all three jumping at the same time. As you can see, I only got two of the riders in this shot, and it was taken at 50mm. If I had been shooting with the 100-400mm lens, I would not have been able to shoot this wide shot. Then it was back to the traditional rodeo events, and I was back in my seat (for a little while anyways). I photographed the first couple sets of these steer wrestlers at a really fast shutter speed. The photos were fine but seemed to lack the drama that I was seeing in front of me. So, I decided to slow the shutter down once again and pan with the riders. This was a little tricky, because I had three subjects in the frame and, at times, they would be going at different speeds. This was one of my favorite photos from the day. My daughter asked if we could get up and walk around. To me, this meant that we could go explore together, and to her this meant that she could go shopping for a new sweatshirt or hat. After she and I sucked down a corn dog, we found some open seats that were low and right by the action. I grabbed some more photos from this location. This bull had no intentions of leaving the area, so some cowboys had to rope him and give him some direction. I photographed a bunch of the bull riders, but since most of the action was right up against the gates, it was tough to isolate them from the background. I like this shot with the bull's face in the dirt, eyes wide open, while being surrounded by a whole lot of cowboys and cowboy hats. In between the bull riders, there were women performing in the barrel racing. It was a fun challenge to change all the camera settings (to slow the shutter) for these riders and then quickly change them once again for the bull riders. The last event that we saw, before heading back home for the evening, was the freestyle bull fighting, where these guys did their best to tease the bulls while staying in one piece. See...if you ever have a bull charging you, now you know that all you have to do is jump over him! it was cool that you had a daylight rodeo, all of mine have been early evening , but sometimes I get a few good ones. Jeff, Some great first time rodeo shots! I find this is one sport where you keep both eyes open while shooting so you can anticipate what is happening. 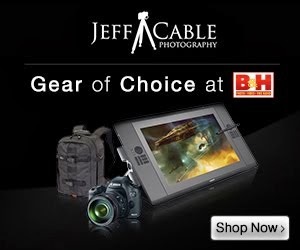 I really enjoy your B&H videos - great stuff!